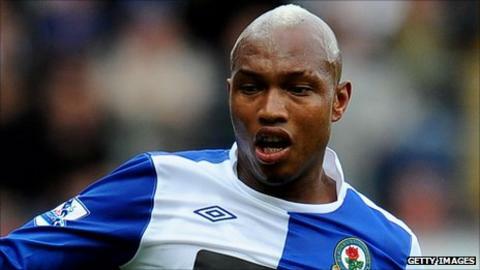 Blackburn Rovers have terminated the contract of forward El Hadji Diouf, Rovers boss Steve Kean has confirmed. Diouf fell out with Kean after returning late for pre-season training and the club have now decided to cut their losses. "Dioufy has left the club. I think we reached a mutual-consent termination of his contract last night," the Scot said on Thursday. "He will be moving on to pastures new and we wish him all the best." The former Bolton and Liverpool forward had indicated his desire to leave the club last week, after hitting out at Rovers boss Kean. "When he was coach, he used to talk to me all the time," Diouf said. "He'd tell me I was the club's best player. Then when he became the manager, he changed his opinion of me." The controversial Senegal forward spent the second half of last season on loan at Rangers but they did not take up the option of signing him permanently. Kean, however, was pleased to have kept hold of his key players despite plenty of speculation surrounding Chris Samba and Steven Nzonzi - while he also added centre-back Scott Dann and strikers Yakubu and Jordan Slew to his squad before the transfer window closed. And he had more good news for Rovers fans after revealing a "deal in principle" had been reached with Junior Hoilett on a new long-term contract which should be finalised in the next 24 hours. "There was interest in Steven but we fought it off," added Kean. "There were no bids that came in for Chris Samba and although there was plenty of speculation that bids would come in they never materialised. "I gave Chris a couple of days off intentionally to make sure he was out of the country and we are delighted he is still here."